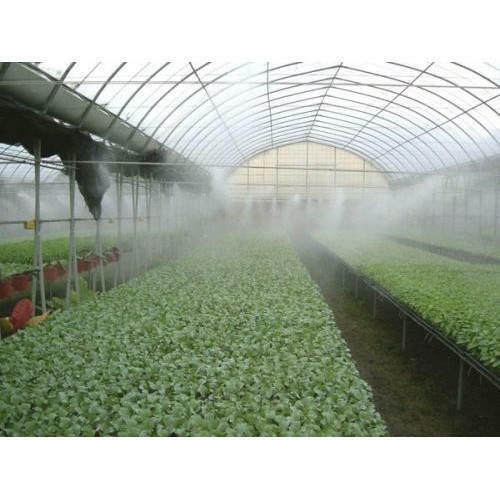 Fogging systems found applications in different greenhouses as it is always a need to cool down the temperature with the help of this system. It is extensively used in both commercial and residential greenhouses. It is designed by using sharp edge technology to lower the temperature and increase moisture in the air. Fogging systems help in creating favorable conditions for various crops to yield. Our range of fogging systems consists of high pressure fogging system and low pressure fogging system. These are highly appreciated amongst customers for their sturdy construction, low water consumption and easy installation. High pressure fogging system is used to generate fog at very high pressure and speed. These are compact sized devices especially designed for cooling and humidification process. Our systems are based on micro cool technology which ensures gentle and flawless fogging production. It creates high pressure fog in the area where humidity, moisture and temperature controlling is required. These are strengthened with various electronic control, which make these extensively useful and easy to control.